WHEAT flour, palm oil, salt, barley malt extract, glucose-fructose syrup, WHEY product, poppy SEEDS, sugar, SESAME SEEDS, emulsifier ( mono- and diglycerides of fatty acids), WHEAT STARCH, yeast, acidity regulator (sodium hydroxide), BUTTERMILK powder. May contain traces of SOY. Who doesn't know the popular little salty snacks that are the best companion for all TV dinners and parties since so many years? 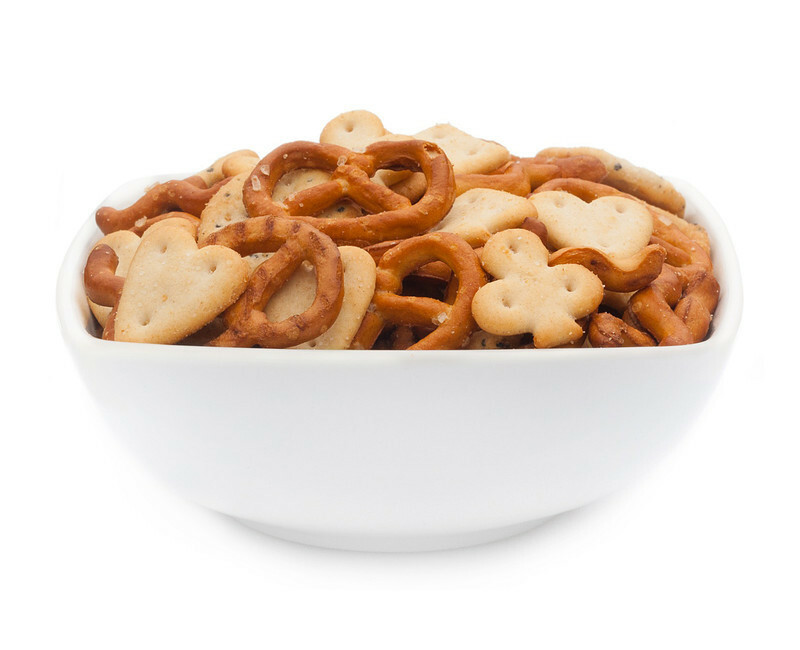 In our cocktail MIX, we have compiled some of the most popular salty snacks: beautifully crispy, small, curled pretzel sticks, the crispy salty pretzels. Not to mention the round little salty crackers flavoured with delicious poppies and a special place is the salt crackers in the colours of the playing cards: Diamonds, Hearts, Spades & Cross. Creative Mix, salty snack classics. What would the landscape be without the tasty snack, small pretzels, waved small pretzel sticks and without the crackers with poppy seeds and the salt crackers coloured like the playing cards? On all those little crispness you can not renounce very easy, when we think of movie nights in the company of a well-tended cocktail at the bar or in the decoration of a delicious cheese plate. Enjoy our COCKTAIL MIX wherever you are, he will for sure remember you instantly from a special event in your life. Our COCKTAIL MIX is a small one, but it's the perfect blend of salty delights that have established themselves as classics in bars and living rooms of the world a long time ago. Also, you will remind at first sight the one of your first snack favourites. Who doesn't like that small liquor treats and salty crackers in various shapes? Perfect as a snack, in one cozy evening at a bar or watching TV with friends and family. It's ideal also served at the movies or as a nice cheese plate decoration and very popular Mediterranean antipasti. With this mix, you're guaranteed nothing goes wrong!